Zoonosis is a fancy word for the diseases and parasites that people can get from animals. Overall contact with our animal companions has fewer risks than our daily interaction with people. Most of the infections we can get from our pets can be prevented by simple hygiene, and proper preventative pet health care. As we discussed above parasites like roundworm, toxoplasmosis, and hookworm are spread through the stool of an animal that has parasites. Pets with parasites do not always have diarrhea—so don’t count on your pet being parasite free because they have normal stool. Instead make sure you are using an appropriate parasite control regime. In addition to parasites in poop, there are the creepy crawly ones—the fleas and ticks. 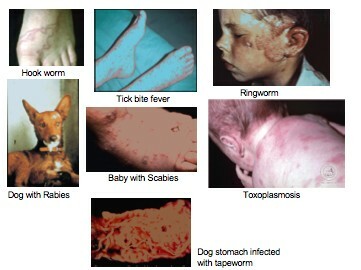 These annoying parasites can give diseases to both you and your pets. Now days there are easy medications to control all of these pesky parasites and your Veterinarian is the best source of information for the products best suited to your needs. Rule #3: Keep your pets properly vaccinated. Rabies– Most cases in New York are in wild animals but every year there are a few cases reported in cats, dogs, and livestock. While human cases are rare, they are fatal unless immediate preventative steps are taken. For this reason health departments take animal bite wounds VERY seriously. If a pet is not vaccinated the health department may insist on quarantine or euthanasia for rabies testing even if the pet appears healthy. So what should you do? Always, ALWAYS, keep your pet current on vaccination. It’s effective, it’s simple, and it’s important. Veterinarians are trained to recognize infections that can affect people as well as animals, how to prevent and how to treat them. Let us know if you have any special concerns or if anyone in your family is more susceptible to infections.